Do you really know how old your spices are? 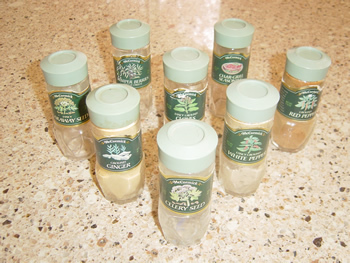 It seems that I'd been putting off going through my spice rack for fifteen years - yes, you read right - fifteen years. I knew the spices were old but I didn't know just how old. They were manufactured in Baltimore, Md., which McCormick says are at least 15 years old. Needless to say they have been replaced. Have you checked your spice rack lately? If not, we have provided a guideline for the shelf life of herbs and spices. I have listed some of the better known spice companies here for you. I know from experience that spice brands easily found in supermarkets such as McCormick and Spice Island offer a wide variety, but when you're looking for specific spices such as Indian spices, Thai, Moroccan or Mexican spices you may have to order them from a specialty spice company. Click directly on the logo to be taken to that site - and enjoy shopping for fresh spices!